Am celebrating virtually a birthday of my fellow blogger aka sister, she is none other than Divya of Divya's Culinary Journey, the bonding between few bloggers are seriously very close to my heart and one among those wonderful blogger i crossed and get connected through this virtual world is Divya, she is a simple, very easy going gal who is very modest,down to earth and very friendly sister, i treasure her relation very much. We had loads of laughters and fun together whenever we chat together. Today is a big day for her and she is celebrating her birthday with her parents and her brother in her native. Have a wonderful birthday Sis and am sure this birthday brings you loads of beautiful things in your life. Divya,a sister can be a good friend too, and definitely you are.I am so thankful to God to have a sister like you in my life. Wishing you a wonderful birthday and celebrate your birthday in a big way. To celebrate Divya's birthday virtually, with few friends we choosed to make dishes from starters to desserts. 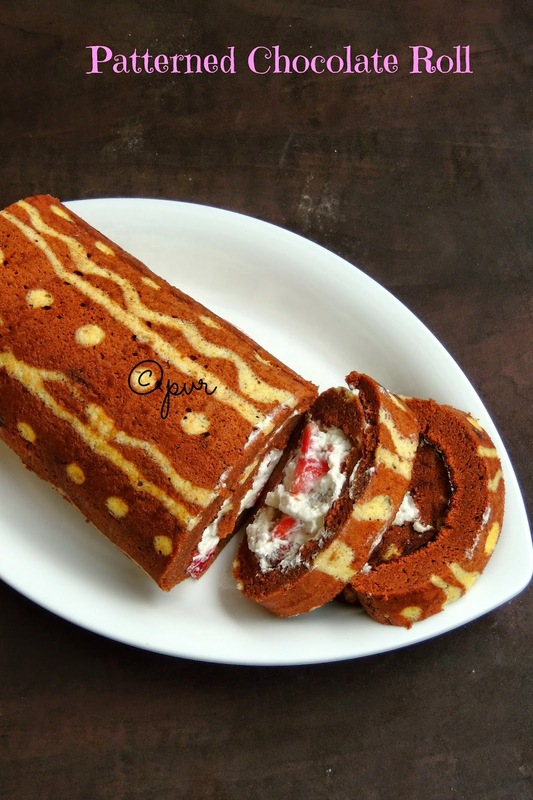 Obviously i went for this patterned chocolate cake.Swiss roll or cream roll is a kind of sponge cake roll stuffed with either whipped cream,fruits or buttercream or sometimes simply with jam. 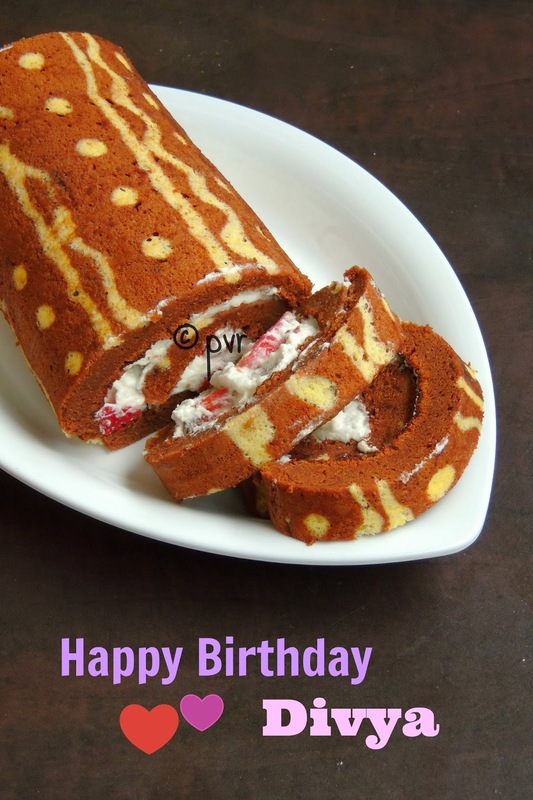 A thin layer of batter prepared with flour,eggs and sugar baked in a sheet pan, spread with jam or buttercream, rolled up and served as round slices makes this roll. 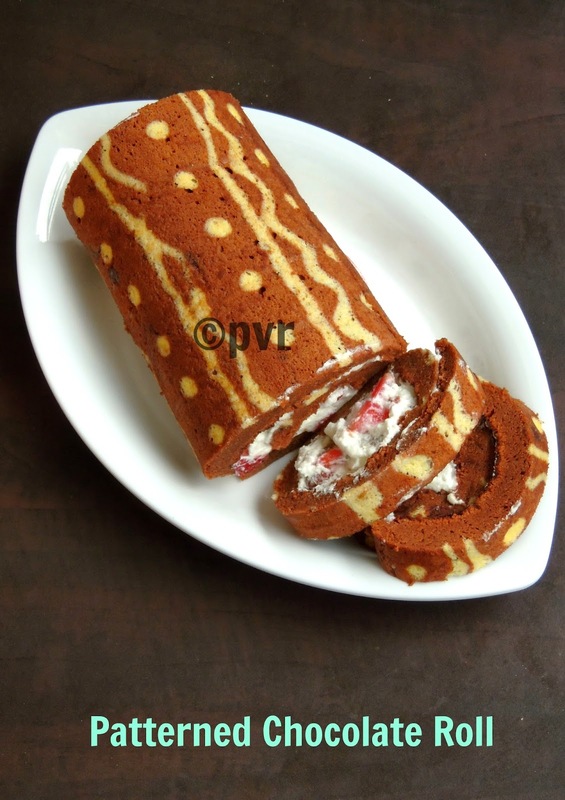 I have prepared this roll with usual measurements i go for making swiss rolls and prepared them as patterned chocolate roll, filled with whipped cream and chopped fresh strawberries. Chocolate roll with strawberries and whipped cream, watelse we need.Heaven in Earth definitely. Beat the egg yolks,vanilla extract, sugar until they turns smooth and plate,add the flour,butter to them, mix everything well and keep aside. Now whisk the egg whites with a pinch of salt until soft peeks forms. Fold the whipped egg whites to the already prepared batter, mix gently until they get well mixed. Remove quarter cup of the batter, transfer the batter to a piping bag. Line a baking sheet over a swiss roll pan or a baking tray. Pipe the batter slowly as any pattern as you desire. Bake it for 2minutes in the preheated oven. Now add the melted chocolate to the prepared batter. Spread this batter to the already baked pattern. Bake for 12minutes,until the top turns firm. Remove the baking sheet carefully, transfer it to a damp towel, roll it to see the pattern clearly on the top. Keep aside, let it cool completely. Spread the whipped cream, sprinkle the chopped strawberries generously, roll again. Arrange in fridge for few hours. Cake looks really yummy .I am very impressed by the patterns .Such a fantastic birthday treat for divya ..
Priya I had wondered how this pattern creation is done. Thanks for sharing the method! wow!!! that looks gorgeous love the patterned swiss roll!! Awesome and delicious looking chocolate rolls. @Arjunan AkilandeswariSure Akila, will definitely share stepwise pictures soon. Wow!! This is out of the world!! Looks yummy!! Priya chocolate roll looks very in inviting.Never tried this kind. Lovely pattern on the roll, looks absolutely gorgeous and yumm.. The patterned roll looks very pretty..
Gorgeous is the word! Saved the recipe to try :). Thanks for sharing.